Loki 1797 is a bookshelf speaker. It is developed by Blue Planet Acoustic as bass reflex system. 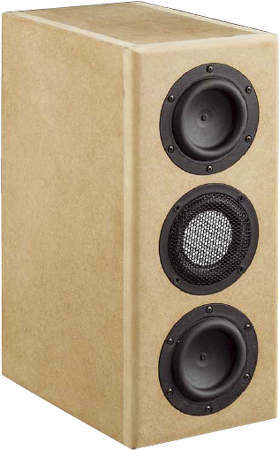 Loki 1797 contains a Tang Band fullrange driver W3-1797 and two Tang Band woofers W3-1876S. The crossover consists of a 3nd order high-pass filter (18 dB per octave slope) and a 3rd order low-pass filter. The high-end kit comes with high-value ClarityCap MKP foil capacitors. The inductances are baked varnished coils for minimizing microphonic effects. - The current flow through the coil creates a magnetic field which sets the reel of wire in motion. This motion induces a voltage in the coil which adds itself to the signal. The stiffer the reel of wire is, the less the signal will be altered.